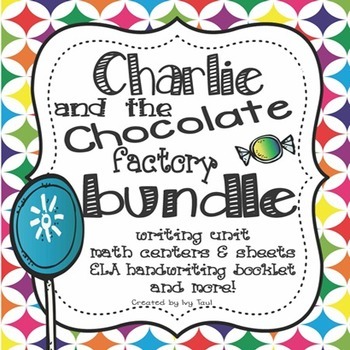 Save over 35% with this Charlie and the Chocolate Factory bundle of fun! This bundle includes over 110 pages! Your first graders will love writing about Charlie, playing Charlie themed math games, and learning language skills with Charlie. 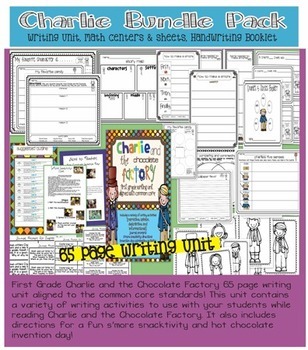 First Grade Charlie and the Chocolate Factory 65 page writing unit aligned to the common core standards! 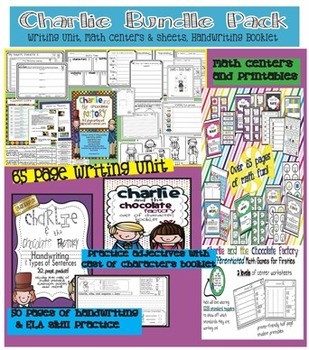 This unit contains a variety of writing activities to use with your students while reading Charlie and the Chocolate Factory. It also includes directions for a fun s’more snacktivity and hot chocolate invention day! Your first graders will love learning about Geometry & Measurement with these Charlie and the Chocolate Factory themed math games! You will love the leveled worksheets! You can quickly assess Common Core math skills related to the game with printer friendly half page center worksheets. Two versions of each center worksheet will also make it easy for you to differentiate instruction. Makes a great addition to Georgia's Common Core ELA Unit 2 or to any 1st grade classroom reading Charlie and the Chocolate Factory. 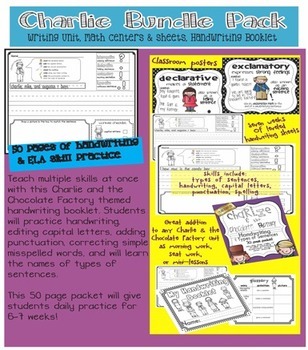 Teach multiple skills at once with this Charlie and the Chocolate Factory themed handwriting booklet. The packet makes a great addition to any Charlie and the Chocolate Factory Unit as morning work, daily seat work, or writing center work. Students will practice handwriting, editing capital letters, adding punctuation, correcting simple misspelled words, and will learn the names of types of sentences. Having a difficult time teaching declarative, interrogative, imperative, and exclamatory sentences to your first or second graders? This 50 page packet will give students daily practice for 6-7 weeks! Students create their own Charlie and the Chocolate Factory Cast of Characters Booklet by writing adjectives that describes each character in First Grade Common Core recommended read aloud, Charlie and the Chocolate Factory by Roald Dahl. Please ask if you have any questions before purchasing! Follow my store for monthly specials!